Mexico opened the new year with what could be its most dubious distinction yet in the 3-year-old battle against drug trafficking â€” 69 murders in one day. The country resembled a grim, statistical dart board Saturday as law enforcement and media reported the deaths from various regions, including 26 in the border city of Ciudad Juarez, 13 in and around Mexico City and 10 in the northern city of Chihuahua. More than 6,500 drug-related killings made 2009 the bloodiest year since President Felipe Calderon declared war on the cartels in late 2006 and deployed 45,000 soldiers to fight organized crime, according to death tallies by San Diego’s Trans-Border Institute. Two weeks into 2010, gang bloodshed is becoming more grotesque as drug lords ramp up their attempts at intimidation. Last week a victim’s face was peeled from his skull and sewn onto a soccer ball. On Monday, prosecutors in Culiacan identified the remains of 41-year-old former police officer divided into two separate ice chests. Mexico is a popular surf travel destination (cheap, uncrowded surf breaks, warm climate and perfect barrels) and travelers have definitely become more wary of visiting (as they should). I have heard stories of whole rural Baja Mexico towns cracked out and run by cartels (articles and friends). Surfers getting their valuables stolen and wives raped. This situation will get a whole lot worse before it gets better. 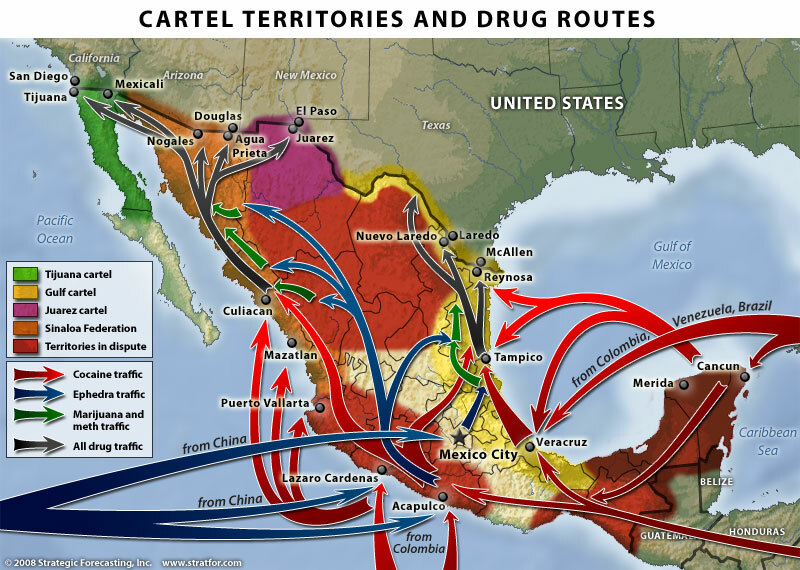 Mexico has become the drug trafficing hub into the US for the entire world due to heightened US Security. There is so much border to watch that America would have to become a police state to stop them from coming in or a genius idea so obvious that it will never come to be reality. Mexico has the poor and corrupt to deal with. Drug addicts and dealers on both sides of the border. Drug and violence epidemics all around. so should the mexican government step in and take over the drug trade to stop the killings? The most mind boggling part of this whole tragedy is that everyone knows how to end the violence, legalize and regulate all drugs. This is what inevitably happens during prohibition, alcohol prohibition created capone and formed the foundation for organized crime as we know it, this is no different. So, yes, the mexican government should take over the drug trade and regulate it. It’s ridiculous, all of this over chemicals that make people feel good. Even if it damages some people w/ addiction, it’s still better to be legal and regulated, than fighting a “war” that is impossible to win. Better (and cheaper) to deal w/ addicts than cartels. I thought the Mexican government did decriminalize some drugs.